For the Greater Glory of God, and the salvation of our souls, we have discovered a call to consecrate ourselves completely to Jesus Christ, in radical poverty, chastity and obedience. In communion with the One, Holy, Catholic and Apostolic Church, we are inspired to live the Gospel through the evangelical poverty of St. Francis of Assisi and the apostolic formation of St. Ignatius Loyola. "MAN IS CREATED TO PRAISE, REVERENCE AND SERVE GOD"
We are a community of priests and brothers committed to advancing the New Evangelization through the Praise, Reverence and Service of God, our Lord. Providing teachers, Bible study leaders and campus ministry. God uses the Spiritual Exercises of St Ignatius Loyola to reveal inspirations for a religious community to Aron Little while working at the Franciscan University of Steubenville, Steubenville, Ohio. God brings two Franciscan University students, Matthew Fenter and Thomas Yager, together before the Blessed Sacrament in Houston, with inspirations for a new religious community. The Founding. 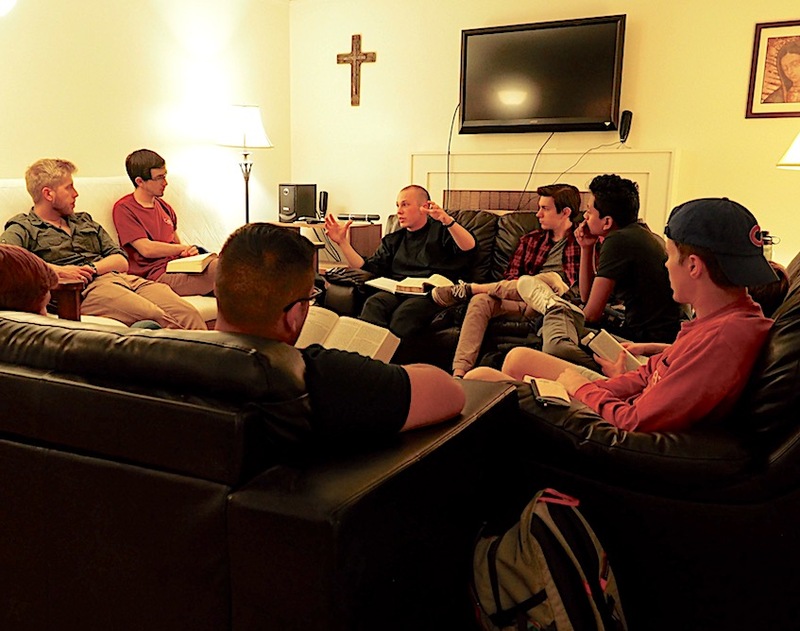 At Franciscan University of Steubenville, God unites Matthew, Thomas and Aron in prayer, reflection on the Philippians 2 hymn, and their inspirations for religious life. God inspires Matthew to communicate His invitation to the men “to step out of the boat and to come follow Him.” The men commit to prayer and penance in founding the community. On Ash Wednesday, Matthew, Thomas and Aron submit their request to become an Association of the Christian Faithful to Bishop Conlon of the Diocese of Steubenville, Ohio. In June, Aron directs Thomas through the 30-Day Spiritual Exercises, during which the Lord reveals and confirms Thomas’ call to pursue family life.